Usually ships 3 - 5 business days after order processed. Payments as low as $20/mo. 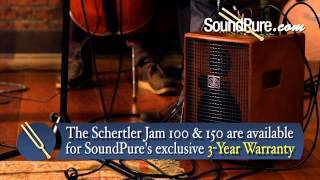 The Schertler Jam 100 and Jam 150 acoustic amps are versatile, lightweight, portable, and affordable. They offer amazing tonal clarity, dynamic range, and can function as mini PA systems. They are perfect for practice spaces and coffee shop gigs. Both amps are available for SoundPure's exclusive Try-Before-You-Buy program, so if you want to hear how these amps sound with your gear, shoot us an email at Acoustics@soundpure.com. If you like what you hear, you can check out all the gear used in this video at SoundPure.com, or call us anytime at 919.682.5552. Thanks for watching! This sensor has been specially designed for use with Archtop-Maccaferri-Selmer guitars. Based on Lydia technology, STAT-MACC is engineered with a high quality electrostatic microphone inside the transducer. Its cork and cotton fibre construction materials have been specially ed to give natural, high fidelity sound. Fixed between the soundboard and the bridge, it captures only the mechanical vibrations on the instrument and is also highly resistant to feedback. STAT-MACC is easy to apply and remove without any risk of damage to the guitar. STAT Series contact microphones are packaged with a choice of preamplifiers that give the player flexibility and control over a range of sound parameters. See STAT-MACC-SET, STAT-MACC-PRO, STAT-MACC-ROAD. The STAT electrostatic microphone requires 10V phantom power. It works with our preamplifiers STAT PRE and Yellow series, as well as with Schertler amplifiers that are equipped with 10V phantom.